Father’s Day 2018 is Sunday, June 17, and you’re in luck if you find yourself in the Wichita, KS, area looking for a gift for dad. 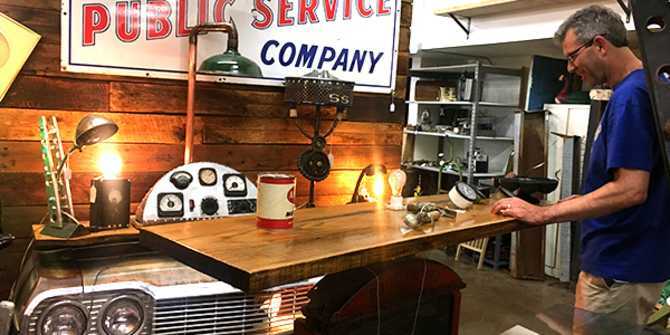 Shopping is fantastic in Wichita, and we’re making the quest to find the perfect father’s day gift easy by curating this list of gift ideas for dad. Vintage and new signs, fishing lures, books, furniture, collectible rocks and crystals are just a few of the uniquities to be found among more than 200 booths spread across the 35,000-square-foot Paramount Marketplace. Paramount, in business since 1999, also has Paramount Antique Mall and Paramount East Antique Mall. Hatman Jack’s stocks hundreds of hats for men and women from more than 50 brands, ranging in style and price from the least expensive to the finest brands. It is the third-largest brick-and-mortar hat store in the country, and they also sell wallets, scarves, gloves, handbags and other accessories. Or have Jack custom make a hat for your dad. Give dad the gift that keeps on giving: a membership to one of Wichita’s museums or one of the city’s exciting attractions, which affords free visits throughout the duration of membership. Spend time with dad by taking him to a Wichita Wingnuts baseball game at Lawrence-Dumont Stadium. Individual tickets range from $6-$15 and the season runs from mid-May through early September. Sign dad up for a Brew Wagon Tour and better yet, go with him! This is Wichita’s only local brew bus tour. You’ll get at least four samples of beer in at least three Wichita craft breweries, plus access to talk to brewmasters and other behind-the-scenes experiences. You’ll find hundreds of choices of coffees, teas and spices at The Spice Merchant & Company, along with a large selection of accessories and other gift items. From chocolates and other sweets to savory items like popcorn and nuts, you’ll find something for every taste and every budget at one of these Wichita specialty foods purveyors. You can’t go wrong with giving dad a certificate to one of the more than 1,000 restaurants in Wichita, from food truck grub to fine dining options.